After a stop at Goodwill and a Starbucks (first decent coffee in four days) we left San Antonio and drove south to Corpus Christi, arriving around noon. We enjoyed the waterfront area with the city skyline, local crabbers and sailboats. Catfish Charlie’s was our lunch, highlighted by seafood gumbo, fried catfish and fresh jumbo shrimp. 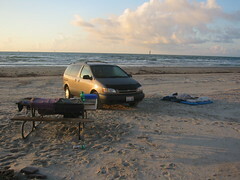 Next, we headed for Padre Island, where we were lured into the warm waters of the gulf. After some debate, we decided to spend the night on the beach camping at Mustang Island State Park. Having spent one night in Texas outside in 90 degrees we weren’t sure that the ocean breezes would keep us comfortable. The park ranger (who was from Salem, OR) convinced us it would be fine. We took a short trip up to Port Aransas to see the ferries. The ferries were very differnet from home. The channel was only about a quater mile across and they run tiny ferries with about twenty cars. But they have six slips on each side, so ferries are taking off every five minutes. We spent the evening at our ‘campsite’ ,with the beach to ourselves. Weeknights in August leave a deserted beach. The gulf water is about 87 degrees, so we enjoyed a few dips in the ocean, one at ten oclock, with a moon reflecting on the waters. It was a surreal experience for this northwest couple. We hauled our cushions and sleeping gear on to the beach and slept outside. The breeze blew all night and kept us relatively cool. We both enjoyed the Corpus Christi area more than we thought we would. It reminded us a lot of Florida.